Professor Fizzwizzle has been chosen as an Independent Games Festival Grand Prize Finalist out of a field of 118 games! 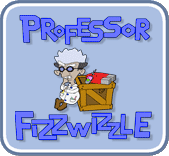 "If you're tired of relying on your twitch reflexes to get you through a gaming experience, warm up your cortex and pick up Professor Fizzwizzle and get your brain a workout. The Professor brewed up a fantastic game that was an easy pick as the Casual Game of the Year!" "A puzzle game that manages to balance fun game dynamics with a genuine mental challenge is rare, but Professor Fizzwizzle pulls it off with ease." "For a shareware puzzler, this is as good as it gets." "Let me point out the one flaw I found with the game: it costs $19.95 to purchase. Truthfully, a game of this quality and quantity deserves to be sold at $49.99 or higher." "The animation, the sounds, everything is perfect. It is like playing a professionally created TV cartoon." "Wow. What a stunning game. Graphics excellent. Gameplay excellent. Can't fault this game!!"